If you like to give your family and friends a unique and personalized gifts, you’ll want to check out this collection of quick crochet projects you can give as gifts. Not only are crochet gifts usually very inexpensive, but you can also use your friend’s favorite color yarn to make them something that they’ll love! Handmade gifts are usually very popular with people, at least in my experience 🙂 And if you are on a tight budget, especially at Christmastime, you can make a very lovely gift with just a couple dollars worth of yarn. Don’t know how to crochet? It’s easy to learn! Don’t know how to crochet, but want to learn? It’s SO easy to crochet, and you can learn to do it very quickly. I learned to crochet as an adult by watching tutorial videos on YouTube, and was able to pick it up pretty fast. It all started when I saw a cute crochet winter hat that I wanted for my young son, but it was over $30…kind of expensive in my book for a hat that he would grow out of in one season. So I decided to see how hard it would be for me to learn to make the hat myself. I found some great tutorials on YouTube and made my first project in just a few hours. And I did end up making that hat for my son…for only about $1 (just the cost of the yarn), and my son was thrilled with it! Now I’ve made all kinds of gifts for family and friends, including baby hat and bootie sets, scarves, coffee cozies, and all kinds of beanies. And it never fails that the gift recipient always squeals with delight and gushes over the gift and declares that they can’t believe that I made it myself! If you’d like to try learning crochet, check out HappyBerry Crochet, my favorite crochet channel on YouTube. Laura will have you learning to crochet in no time with all her beginner videos and easy tutorial videos. 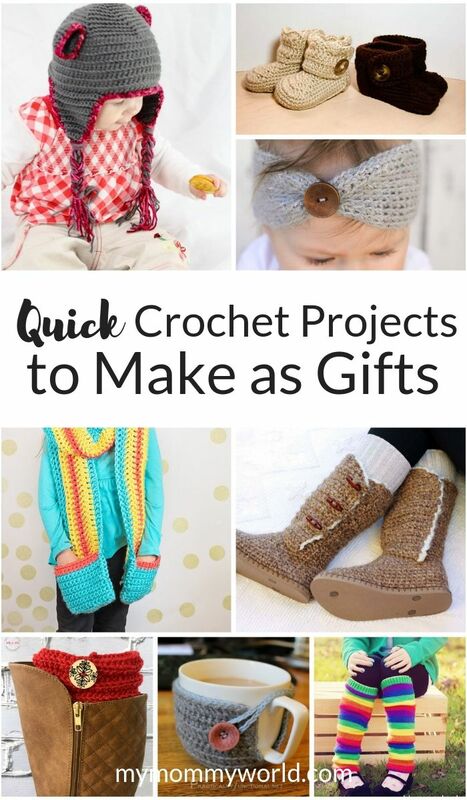 These quick crochet projects are great to give as Christmas or birthday gifts, make perfect teacher gifts and are even great for making as a gift to yourself! I tried my hand at these Crochet Boots with Flip Flop Soles by Make and Do Crew last winter and fell in love with the results! When I wear them, people are amazed that I made them myself. Use this free Morning Mitten Pattern by Make and Do Crew to whip up a pair of mittens for a cozy Christmas gift. This easy Snake Winter Headband by Sisters What is perfect for beginners and will keep your friend’s ears warm all winter. The chunky yarn used in this 30-Minute Chunky Crochet Beanie allows you to whip up a gift in a flash! Everyone loves this Super Simple Crochet Coffee Mug Cozy for their morning coffee. Made in whatever color you like, they are sure to brighten your friend’s morning. The adorable floral design on this Crochet Headband Tutorial by Twin Dragonfly Designs is perfect for the ladies in your life! For those who are always losing their gloves, this Crochet Pocket Scarf by Scattered Thoughts of a Crafty Mom is the perfect solution! Tassles are SO in right now, and this Tasseled Crochet Neckerchief by Persia Lou is just the thing to show them off. If you have a coffee lover in your life, you’ll want to make this adorable Crochet Heart Coffee Cozy for them. Here’s a fun and easy way to dress up that bottle of wine that you bought as a hostess gift: the Wine Bottle Hat and Scarf Cozy by The Stitchin Mommy. This beautiful Christmas Stocking Pattern by Persia Lou uses a shell stitch to make for a really unique stocking to hang on the mantle. 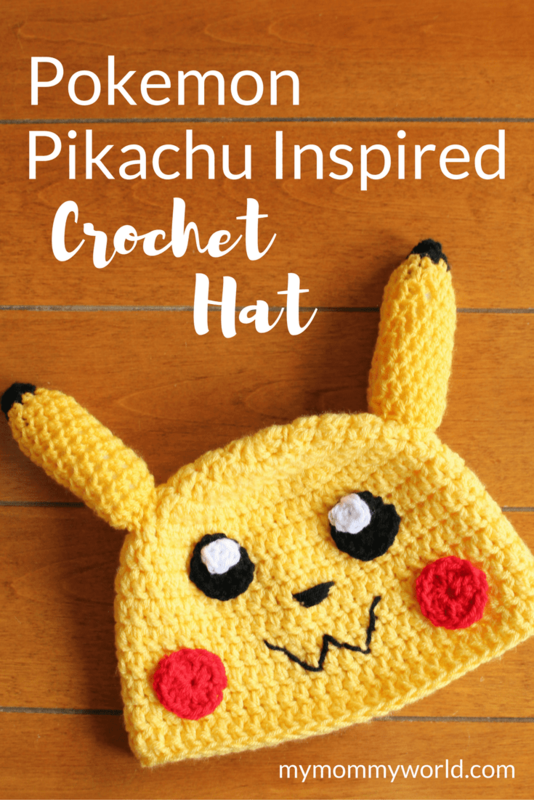 If you have a Pokemon fan in your family, you’ll want to try out this Pokemon-Inspired Crochet Hat. It’s super easy and you won’t find one like it in the stores! Add some holiday cheer to your friends’ cleaning routine with this fun Christmas Peppermint Crochet Scrubby by Petals to Picots. A fashionable Free Crochet Headband Pattern by Make and Do Crew comes in sizes from baby to adult. You don’t see many Christmas stockings with this pretty pattern! Make these Fair Isle Snowflake Christmas Stockings by Petals to Picots for a newlywed couple celebrating their first holidays. Owl lovers are sure to appreciate gloves made from this Owl Gloves Crochet Pattern by Julie Measures. They are too cute! Cozy up little ones in the cold winter weather with this adorable Bear Crochet Baby Hat Pattern by Busy Creating Memories. Decorating the front door with this fun Wire Word Embroidery Hoop Wreath will be an annual tradition. Your friends will love wearing the cuffs you make them with this Easy Reversible Crochet Boot Cuffs Pattern by Must Have Mom. You’ll have to make yourself a pair too! This Chester Christmas Cat Crochet Pattern by All About Ami will make a great gift for any cat lover in your circle. A cozy blanket is the best for snuggling up on the couch with some cocoa on cold winter nights, and this Santa hat Crochet Blanket is just the thing. A fun hat made from this Santa’s Helper Hat Crochet Pattern will be just the thing for little ones (or big ones!) that love to help Santa. This pretty Winter Duo Scarf is sure to warm the heart of its recipient. Made from cozy yarn, this Chunky Double Crochet Cowl by All About Ami will keep your friends warm AND stylish all winter long. 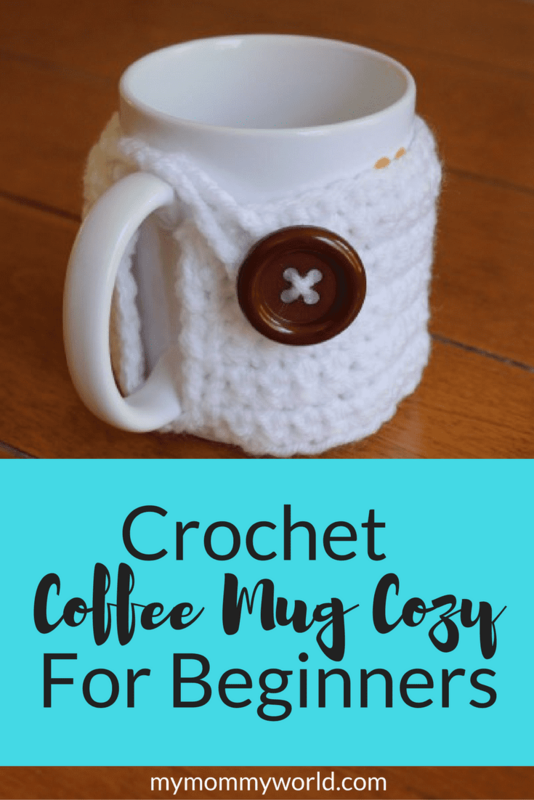 A super quick and easy Crochet Mug Cozy from Practically Functional makes a great gift, along with a mug, some coffee and cookies. Have any old curtains, sheets or t-shirts that have seen better days?Don’t throw them out…make this Crocheted Rag Rug using strips made from old fabric. While not exactly a fast pattern to work, this Cascade Cardigan from All About Ami is gorgeous! Making cozy slippers for your family is easy with this Crocheted Slippers pattern from Sugar Bee Crafts! A newborn wearing these Crochet Wrap Button Baby Boots is to die for! They work for both boys and girls and is sure to be a keepsake. Want to try some more craft projects? Try this Cozy Handmade Blanket! My daughter and myself both crochet. Even my husband learned to crochet as a kid. My daughter recently made a scarf and I’m working on a throw for the back of our couch. I also need to make a new crochet throw rug out of t-shirts. Our old one wore out. You have so many great projects listed I can’t wait to try a couple.